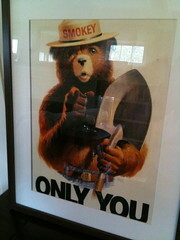 We finally framed this Smokey the Bear illustration we got at a yard sale six or seven years ago. I love Smokey the Bear. I am teaching Cate the song so be prepared to get the inevitable phone call (Grandma Rose & Grammy). The great living room switcheroo is finished as of yesterday. I will write a more detailed post about it later. It looks GOOD. Telfer is a bit of a rock star when it comes to moving around furniture. Last weekend Sherry and I went on a Seattle adventure (with baby J in tow). SO FUN. It's all about the food basically: we went to Top Pot Doughnuts, Trophy Cupcakes, and Chipotle. Still dreaming about the doughnuts especially. Telfer had to work on Valentine's night but the night after Cate spent the night at Grammy's and we made the best steak dinner. Highly recommend this recipe (with the puree). But my favorite was the shrimp appetizer. Well, and the brownies. Does anyone else watch Top Chef? Carla is so my favorite Chef ever. Her reactions and expressions just kill me. I could be her friend. It might make me tired but I am there for her. Especially if she makes me chicken pot pie on occasion. We watched The Social Network last week. Highly recommend. On to The West Wing as Aaron Sorkin is clearly the best writer ever. I listened to The Battle Hymn of the Chinese Mother by Amy Chua after reading so many bits in the press. Any opinions? I did not find the book to be as offensive as I expected. And for the record, I welcome all haphazardly drawn birthday cards.